My name is Valentino Achak Deng. 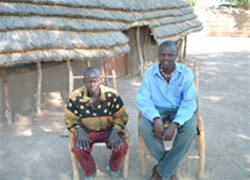 I was a Wakachiai staff in kakuma. I used to publish and edit articles in kakuma for Wakachiai project ( www.refugeesvoice.org). I immigrated to the United States of America (Atlanta Georgia) in 2001 and have lost contact with Wakachiai. I want to restablish my contacts with the Wakachiai’s office in Tokyo, so that I can talk with my Wakachiai friends, specially those visited kakuma before September 2001. How can i do this? I will appreciate any feedback with high regard. It is very exciting to hear from you again. I have alway been thinking about how I can get together with the Wakachiai Project, particularly you. You might know that Wakachiai (late Noriaki) changed my life a lot in Kakuma. I am still very proud that I had served the refugee community in kakuma as Wakachiai staff. Well to cut it short, Immigrated in to the United States on September 25, 2001. My flight to America was on September 11, 2001. I was stranded in Nairobi for two weeks before I flow to New York. I have lived in America for two and half years and I am now a college student in Atlanta. You may introduce my story to Wakachiai website. Just let me know what kind of my story you want to introduce to the Wakachiai webpage and I will write an article about it. I went to kenya and Sudan this past December and I was able to see my family again after seventeen years. I really have a big story that I can write about. I am also working on my autobiography book which will be published in six month. Say hi your to staff, friends and family. Also say hi to late Nariaki’s parents and sister. 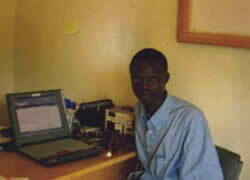 Ｍy name is Valentino Achak Deng I was born in 1978 in Marialbai in Southern Sudan. I am 22 years old. I left my country in 1987 and went to Ethiopia to seek refuge in a foreign land for the first time in my life due to the existing civil war in Southern Sudan. While in Ethiopia I was settled in a refugee camp [Panyudo] in western Ethiopia with the minors who are currently known as the lost boys from Sudan. The refugee camp in Ethiopia was evacuated in May 1991 when the new government that took over from Megistu Haile Mariam orders the Sudanese refugees to leave the country in a few days time. Following this order I faced a very terrible state of insecurity that was on my way back again to Sudan from Ethiopia and within Sudan.I fled to Sudan again in 1991 but I found the situation very unbearable and trekked on foot over a thousand of mile and crossed the Kenyan border town of Lokichogio and finally got settled in Kakuma in august, 1992 by the united nations high commissioner for Refugees. UNHCR. While in Kakuma, I found it important to work with young people by mobilizing and involving them in beneficial cultural activities, and build their capacities in different areas through training and exposure. I succeeded to work with the youth and culture program as staff since 1997 as youth social worker (leader) and was in charge of the following activities in the camp. Drama groups and debating clubs [public speaking session]. Leadership training and behavioral change workshops for the youth. Reproductive health training. Despite all of the above work, I have now taken appositive step to the Wakachiai project as a staff of web program for refugees in Kakuma. I will be assisting in other areas of Wakachiai project activities. In deed I have a great pleasure to work with the Wakachiai project and I shall serve both the project and the refugee community to the best of my ability.